Melbourne Metro project: Locals and traders nervously await rail tunnel construction chaos. What’s happening to St Kilda Road? In her first-floor St Kilda Road apartment, Bronnie Walsh is high enough to be in the treetops but low enough to still feel part of the street. Leaning on the balcony she’s had conversations with people on the footpath below; even invited them up for a drink once or twice. She loves how the trees reflect the seasons. How in winter she can see through to the Shrine of Remembrance but in summer it’s obscured by a screen of leaves.”It’s quite sad looking out to the trees these days. 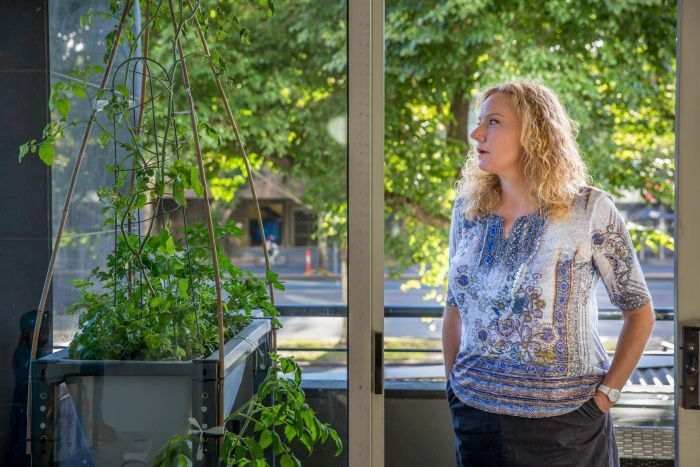 I’m really holding onto every time I look out there and see the leaves … That’s going to disappear.” Walsh has made her balcony into an oasis. A carpet of AstroTurf. Tomato plants growing in planters. Flowers blooming, a cactus on the table. How will Melbourne’s massive $10.9 billion, 9-kilometre Metro rail project affect one of the city’s busiest roads? A teacher, she was so fond of the location that when the opportunity arose, she bought the apartment next door. She rents it out through Airbnb — income she relies on. It’s rarely vacant, and can bring in upwards of $40,000 a year. But Airbnb turns on reviews and Walsh fears the glowing reviews will change after the leafy boulevard becomes a construction zone. Her balcony will directly overlook the huge pit that’s central to the “cut and cover” method of construction preferred by the Melbourne Metro Rail Authority (MMRA). From what residents can tell, the hole will be 300 metres long by 40 metres wide and 30 metres deep. A sign in the window says “Corporate Accounts Available”. 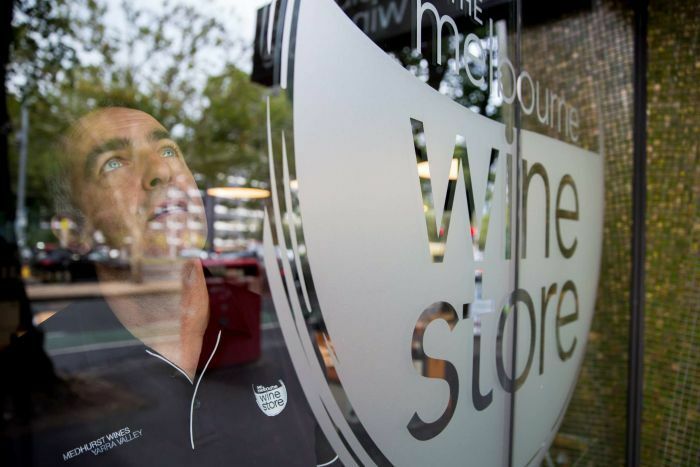 But already there are fewer of those for the Melbourne Wine Store, which for the past five-and-a-half years has been a thriving business for Tony Torcasio and his business partner, who thought themselves lucky to have what they considered a blue chip location on St Kilda Road. More than one resident in the apartments upstairs is selling up. 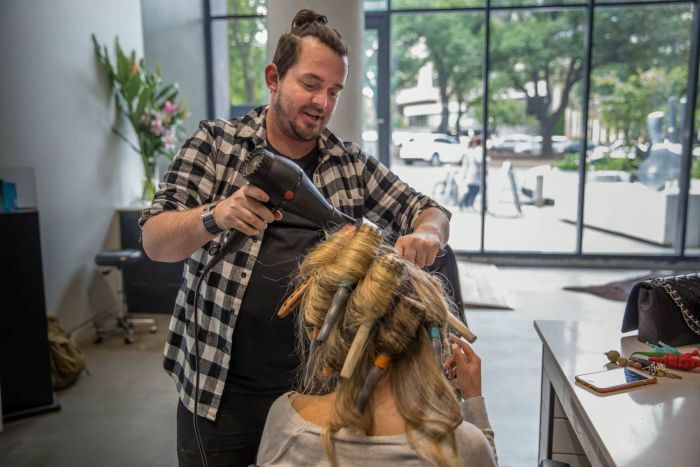 Across the way in Albert Road, Christian Gillon runs Spencer and Co, a high-ceiling hair salon. There’s cowhide on the floor, and the elms of the triangular Albert Road Reserve are framed in huge glass windows. A lot of his clients, too, are local — and planning to leave the area.”I’m extremely concerned. 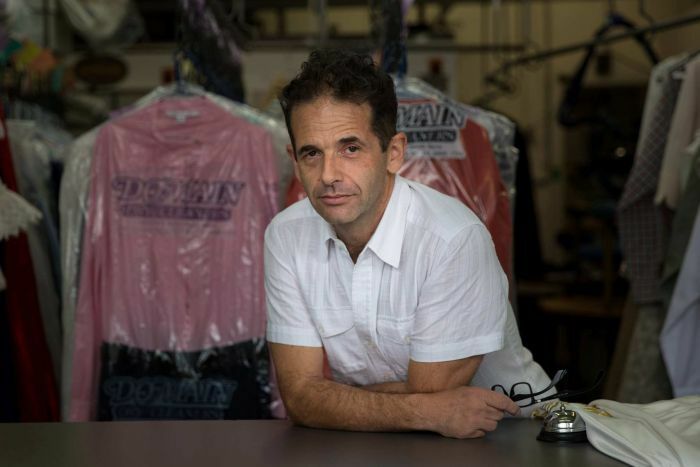 If there’s no parking I potentially lose up to 50 per cent of my business,” he says. He thinks the train station will be a good thing — if he can survive its construction. Gillon’s lease can’t be broken without sending him bankrupt, so his only option is to stick it out. Near the corner of Domain Road and Park Street, a cluster of boutique stores and restaurants face the botanical gardens. Mums pitch strollers on the footpath to brunch in the sun. But the number 8 tram that makes this neighbourhood so convenient is being rerouted. 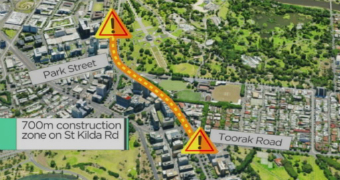 Rather than snaking down Domain Road and along Park Street before joining Toorak Road, it will turn directly into Toorak Road from St Kilda Road, bypassing the whole neighbourhood. Instead of the tram, traders here have been told to expect 250 trucks a day. That’s 500 movements in and out during construction. If they’re spread across 24 hours, it means a truck will go past once every three minutes. Not exactly conducive to relaxing outdoor dining. Telly Gialousis, who runs the Domain Brasserie, remembers when the tram tracks on the corner of Park and Domain were recently replaced. His revenue plummeted 45 per cent during the five-day project. He’s dreading what’s to come. 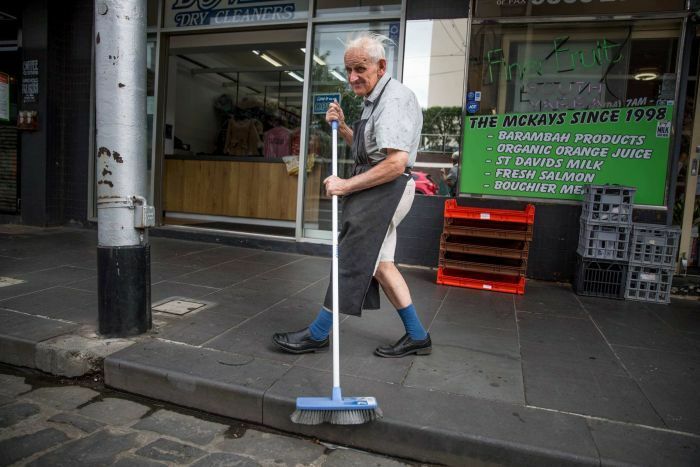 Out the front of the fruit shop, 77-year-old David Richardson is sweeping the footpath. Aproned, his silver hair rustling in the breeze, he’s a vision out of an earlier era. The shop has been run by Mitch McKay for 18 years. McKay is most concerned about his elderly customers from the building across the street. Most are in their eighties and unable to walk far. He says they’ll be virtual prisoners in their own apartments without the tram stop close by. He’s worried, too, about the schoolgirls who stream through the area lugging heavy bags and musical instruments, and who will now have to negotiate heavy truck traffic. He says the MMRA made the decision to move the tram line without considering the full impact. Next door in the laundromat, John Atha runs one of the longest-standing businesses on the strip, another family affair. For 35 years he’s been keeping locals looking sharp. Atha leans on the counter, takes off the glasses he wears to better spy the rips and stains. “It’s not three months, it’s not six months. It’s eight years. They said five but nothing ever runs to plan so I’m guessing eight. The MMRA says there are no property acquisitions in the St Kilda Road precinct and therefore no entitlement to compensation. But it says it’s developing a range of “business support measures”, including signage, marketing support and “local events and activities” to draw people to the area. It says the significant tunnel workforce will be encouraged to shop locally and it’s liaising with Small Business Victoria to provide “skills enhancement opportunities” for affected business owners. At the wine store Tony Torcasio is doubtful. “Might, maybe, whatever. It’s all pie in the sky isn’t it? You don’t know. Some larger businesses are leaving the area. Gaming giant Tabcorp is relocating it’s entire Bowen Crescent datacentre — 750 to 800 staff — to Collins Street, Docklands in July. In a statement the company told the ABC the main reasons for the shift were “space and amenity”, but wouldn’t comment on whether the Metro construction was a factor. However the company’s General Manager of IT Service Delivery, Simon Duck, last year told the inquiry into the project that it posed the threat of interruptions to crucial power feeds and communications at a potential cost of hundreds of thousands of dollars per hour. Tabcorp’s departure does come in the context of a longer term trend away from office space and towards residential development on St Kilda Road. 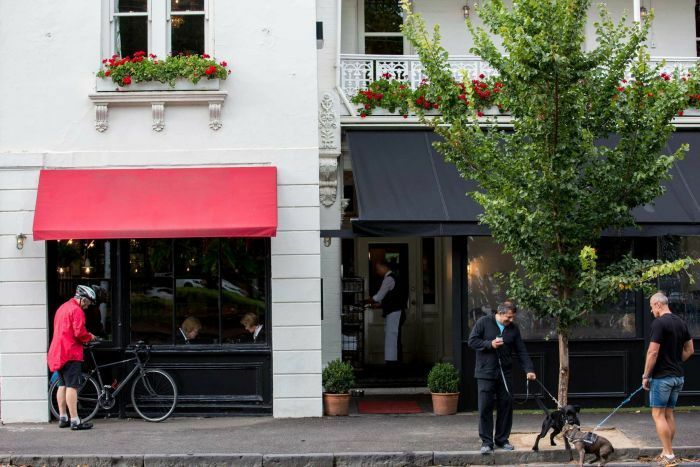 The ABC understands the Royce Hotel, which markets itself as a designer, five-star establishment, has a permit in hand to add more rooms by developing the property next door, but there is speculation the plans have been shelved for now. The Royce did not respond to requests for clarification. At 401 St Kilda Rd, where celebrity chef Shannon Bennett once ran his Café Vue, chairs are stacked on tables. A spokeswoman confirmed that Bennett, who owns the real estate, is currently utilising the downstairs area as a pastry production kitchen. But, in a gesture of optimism, notice of a liquor license application is posted in the window. The venture? A new location for Bennett’s Benny Burger fast food foray. Perhaps he’s thinking of capitalising on the hungry hoards of construction workers about to flood the area.